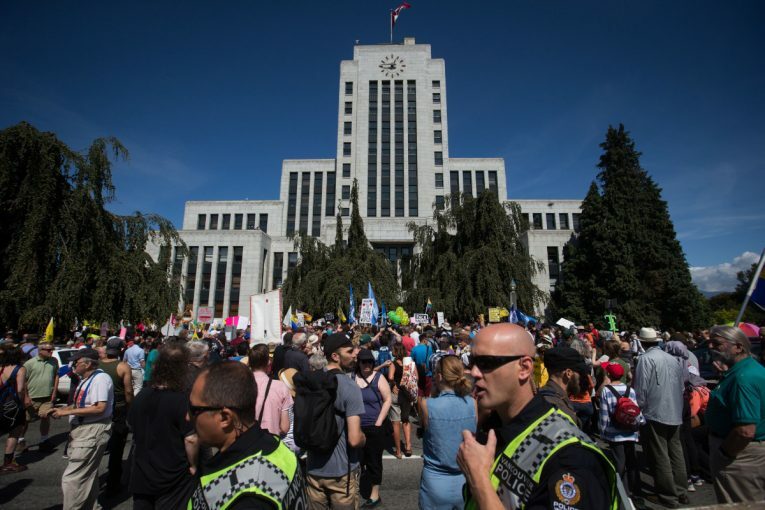 VANCOUVER—Messages of love, tolerance and understanding were shared by thousands of people who gathered on Saturday to protest racism and hate. Signs reading “live with love,” “diversity = strength” and “laundry is the only thing that should be separated by colour” were spotted above a packed crowd outside Vancouver’s city hall. Police said about 4,000 people attended the rally. The large number of people caused officers to close a busy road in the area to vehicle traffic for several hours. Bob Chamberlin, vice-president of the Union of British Columbia Indian Chiefs, told those gathered that he draws strength from seeing so many people come together with love and respect. Now is a critical time in Canadian history, he added, and all Canadians must stand together for reconciliation with First Nations to be successful. Robertson urged those assembled to approach the difficult conversations peacefully. “Reach out with a hand, reach out with respect and love and understanding. Don’t reach out with a fist. Don’t lower ourselves to that,” he said. There were reports earlier this week that an anti-Islam protest was planned, but it never materialized. A handful of individuals opposing the anti-racism protesters showed up at the rally and were quickly ushered away by police when verbal confrontations appeared as though they could become physical. Police said there were no reported assaults or injuries.